NOAA imagery for the Barrier Island areas of Toms River. Above shows before Sandy. Below shows after Sandy. He was right. 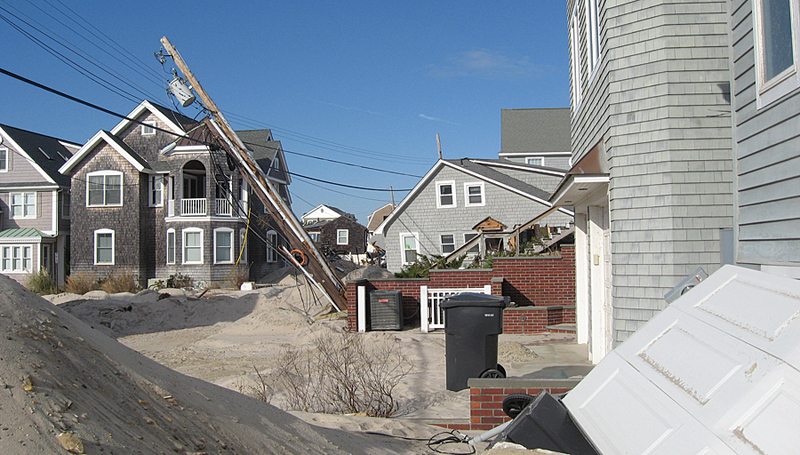 When Hurricane Sandy hit the East Coast of the United States in October 2012, the map was suddenly the go-to information source for emergency responders, utilities, public works, private surveyors, and local assessors. Bundra quickly updated the map—known officially as the Toms River Municipal Utilities Authority GIS Map. He added poststorm satellite imagery from the National Oceanic and Atmospheric Administration (NOAA) along with current floodplain delineations and Sandy high water mark data from the Federal Emergency Management Agency (FEMA). Anyone who needed to quickly get an accurate picture of the Sandy situation could click the TRMUA GIS Map. Bundra built it, and people did come. Police and fire fighters came to determine where to deploy resources. 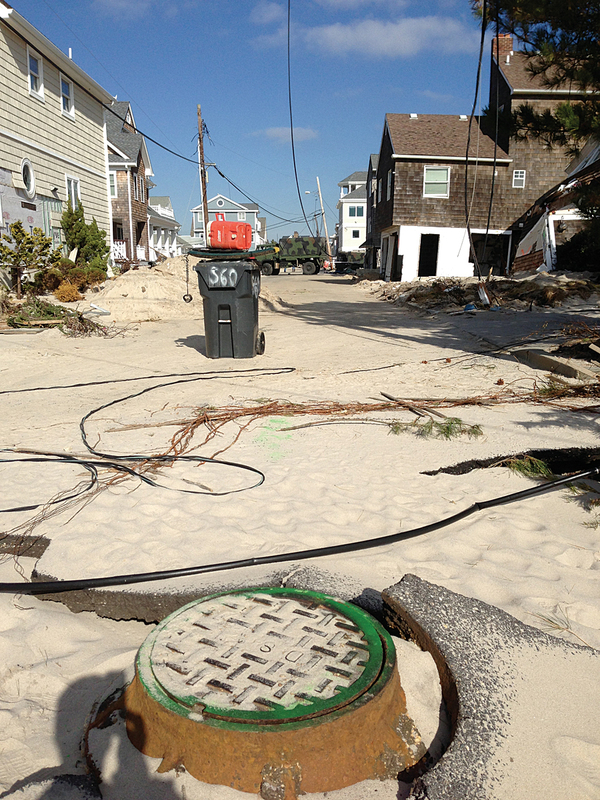 Electric, gas, and water companies came to decide where to start restoring services. Homeowners, evacuated and eager to survey the damage to their property, came to look at before-and-after aerial photos. And, as Bundra predicted, people most definitely did become aware. Since the TRMUA GIS Map was built on the Esri ArcGIS platform and hosted by Amazon Web Services, it provides virtually unlimited power for analysis, collaboration, and spatial data processing. 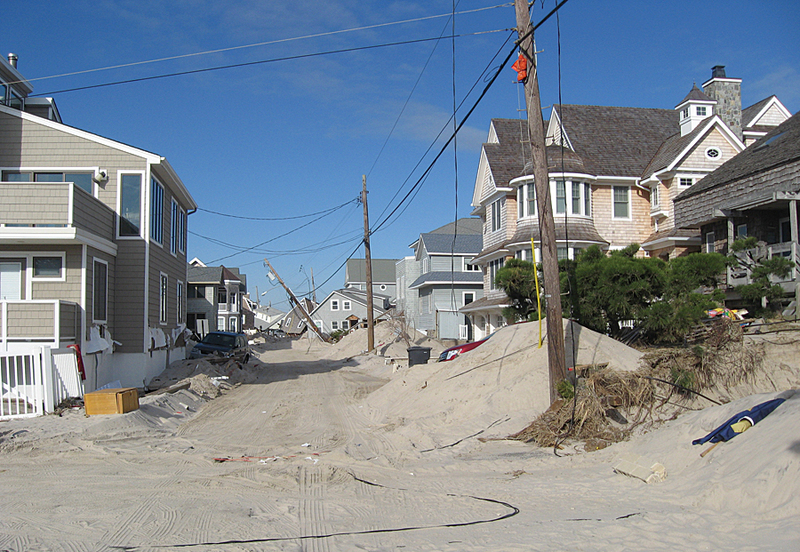 For example, following the storm, many outside contractors arrived on the shores of New Jersey to restore the region’s infrastructure. One group in particular was engineers who needed to figure out the best plan for repaving roads. The TRMUA GIS Map helped them find their way around unfamiliar areas. They were able to use the map to locate important elements such as parcels, street addresses, hydrants, and underground utilities. In the weeks and months following Sandy, the map continued to help. 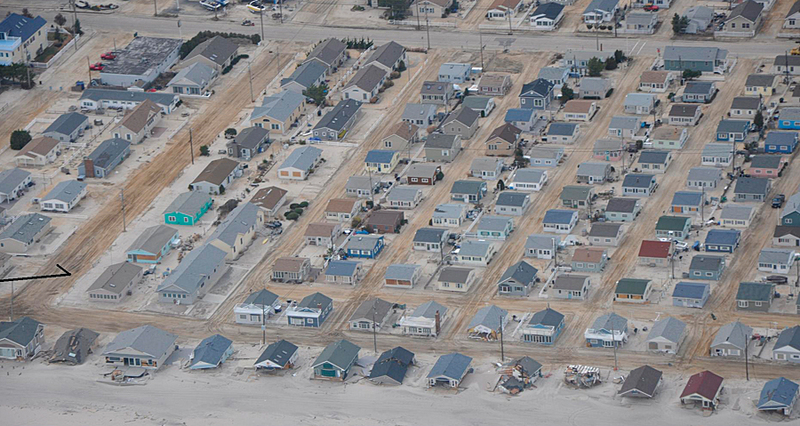 Utilities used it to review parcel polygons on the barrier islands to identify houses and neighborhoods that were destroyed so those ratepayers would not be charged for the year 2013. The map’s links to FEMA flood advisory maps is helping affected townships adopt a new flood insurance risk map. Bundra also recently added a layer to show houses that are slated for demolition and/or labeled uninhabitable to advise citizens and utility companies on where to focus rebuilding infrastructure. Before Bundra created the map, Otten said TRMUA engineers had to sift through a room of drawers with thousands of engineering drawings for information or request data from other departments or agencies. Often, they would have to send out crews for field visits. Now everything they need is on the computer screen with an aerial basemap. There are 2,558 points hyperlinked to post-Sandy aerial oblique photographs from Civil Air Patrol added to the TRMUA GIS Map. Otten says he can now view maps of all 430 miles of pipe, 9,600 manholes, and 18 pump stations, along with all attributes. At a glance, he can see whether a pipe or manhole has been inspected or rehabilitated and then simply click to view an inspection report or video. 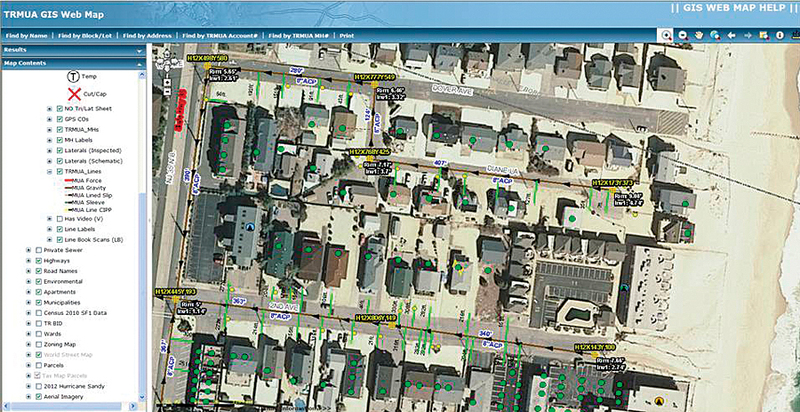 He can access various aerial maps, including post-Hurricane Sandy and aerial basemaps from as far back as 1930. He can tell when a service lateral has been cut and capped and see the triangulated location sketch of the curb cleanout. The map shows all billing information, including the recorded number of fixtures within a building. It also shows pump station data and the number of connections flowing to the station, hundreds of pages of data on emergency generators, wiring diagrams, pertinent engineering drawings, and pump curves. TRMUA began its GIS work in 2005 in an effort to assemble 40 years of paper plans and files into a centralized mapping interface. The system was built entirely by in-house staff, without the use of any outside consultants, and was completed within two years. 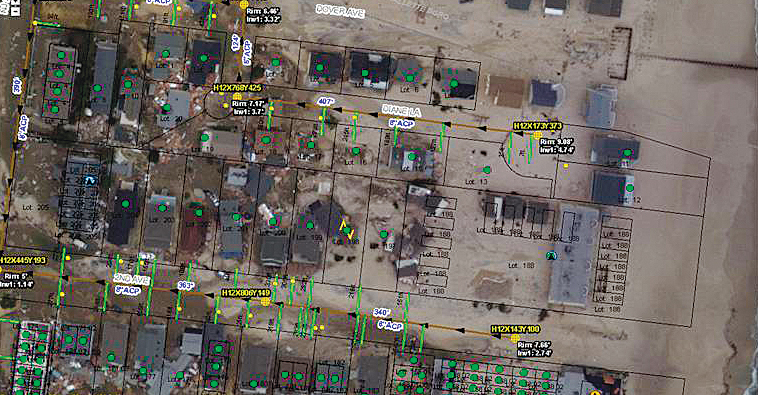 All 9,600 of TRMUA’s sewer manholes had exact coordinates verified in the field using submeter GPS units. More than 600,000 line and manhole attributes were entered into an Esri geodatabase from more than 3,000 engineering plans. In addition, an entire GIS parcel basemap was created from scratch to include additional elements not typically found on the tax maps. For example, 3,000 individual condo units and all major apartment buildings were added to the basemap, which was then aligned to New Jersey State US Geological Survey (USGS) orthophotography. The system is now available for all TRMUA office staff across an internal network and to all field staff via ruggedized laptop units. For more information, contact Leonard Bundra II, IT/GIS director, Toms RIver Municipal Utilities Authority.